Virginia moved up six places to number seven in CNBC’s Best States for Business 2017. Complementing the breathtaking backdrop of glistening lakes and majestic mountains, the Roanoke Region has created a dynamic business climate that fuels a mix of small and large businesses and industries, contributing to the overall state ranking. In addition to the overall ranking, Virginia ranked second among all states for workforce quality. 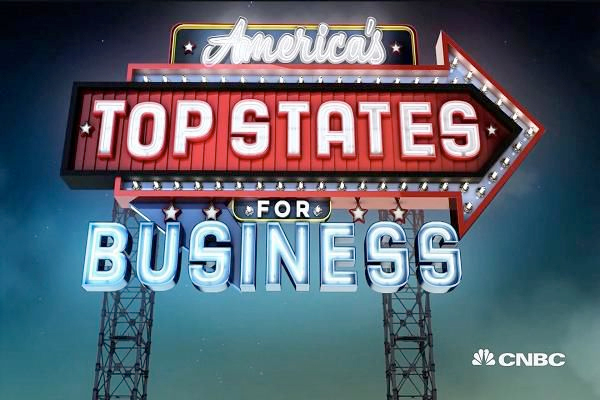 “We are thrilled that CNBC has recognized our efforts to build a new Virginia economy by ranking the Commonwealth number seven in their Annual ‘Best States for Business’ in 2017,” said Gov. Terry McAuliffe. Since Gov. McAuliffe took office Virginia’s unemployment rate has dropped from 5.4 percent to 3.8 percent (a nine-year low). Unemployment claims have dropped to a 44-year low. The Commonwealth has also added 187,500 jobs, and attracted a record $16.16 billion in capital investment, while growing the workforce by 60,000 jobs. The Governor has made reforming and investing in education one of the top priorities of his New Virginia Economy agenda. He helped usher through a record $1 billion investment in the state’s public education last year, while implementing a high-school redesign program that emphasizes high-demand job credentials and on-the-job training. The CNBC rankings are developed by judging the states on a number of business metrics that are separated into ten categories including cost of doing business, economy, quality of life, technology and innovation, education, business friendliness, access to capital, and cost of living. Workforce and infrastructure are weighted at the top of the list among 10 major categories and 66 metrics.